Gaining adequate leadership support to implement the Respecting Choices® (RC) model is critical. Respecting Choices® (RC) has created a conceptual framework that provides the foundation of the program’s implementation strategies. These concepts include key definitions that set RC apart from “advance directive” programs. 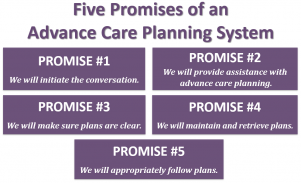 Advance care planning (ACP) is an ongoing process of person-centered communication that includes understanding, reflection, and discussion about future healthcare decisions. It is a process, not an event. 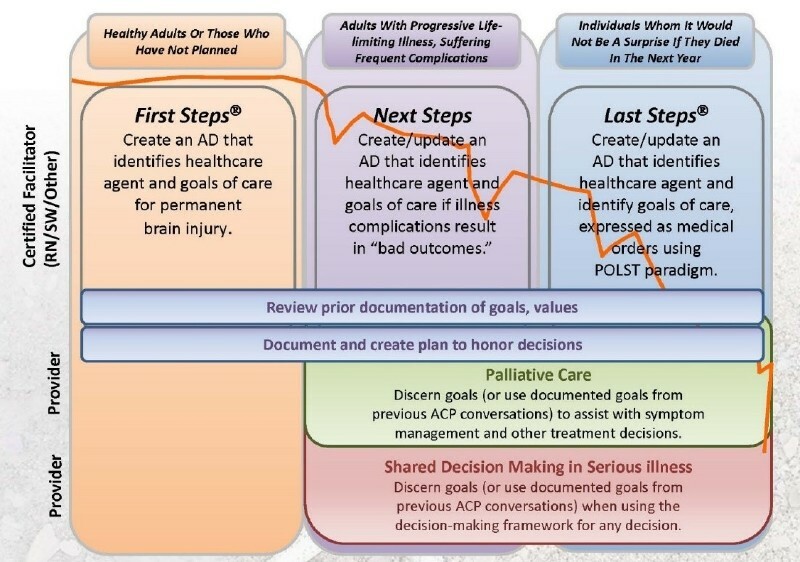 This process of shared decision making ideally includes the individual, his/her family or loved ones, healthcare providers, and others to help the individual reflect on goals, values, and beliefs, understand future situations and related decisions, and learn how to discuss these issues with those who may need to implement the plan. An advance directive (AD) is a plan, written or oral, that communicates an individual’s goals, values, and preferences for future medical treatment. 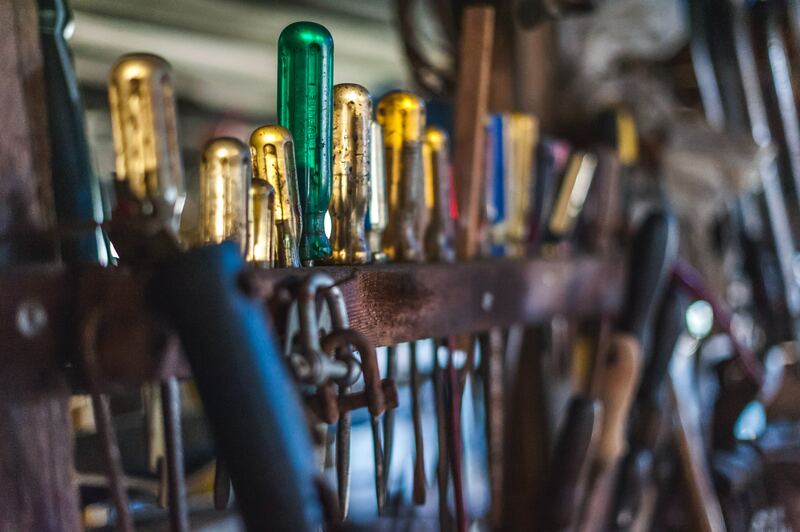 An AD is a broad term that encompasses a variety of written forms, such as living will, power of attorney for healthcare, or a combination of these documents. Person-centered care is healthcare that creates a partnership between providers, individuals, and their families to provide education and support for the facilitation of making healthcare decisions and participating in care. 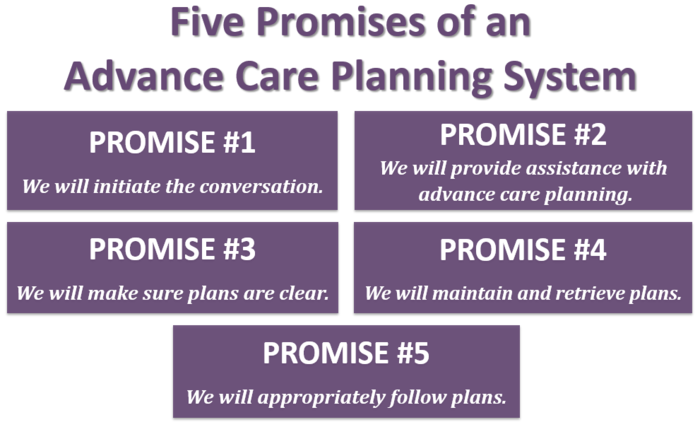 Three key concepts are important for understanding the RC model: 1) the staged approach to planning, 2) key elements in designing the system, and 3) Five Promises made to those for whom we care. 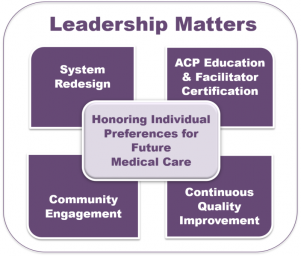 ACP is not a one-size-fits-all conversation. RC has determined that to be person centered, planning is best done in stages over the lifetime of an individual. This staged approach of planning allows for conversations to be individualized to a person’s stage of illness and motivation to participate as well as personal, cultural, or spiritual values and beliefs (see diagram). First Steps® (FS) ACP is appropriate for any healthy adult over the age of 18 or who may have a well-managed chronic illness but has never prepared an advanced care plan. The goals of this stage are to a) motivate patients to plan, b) assist in selecting a qualified healthcare agent/decision maker, c) provide instructions for goals of care in the event of a permanent or severe neurologic injury, and d) complete a basic document. 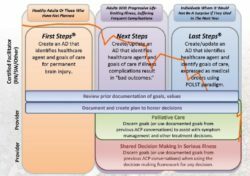 Next Steps (NS) ACP is offered to patients when chronic illness becomes more advanced—when clinical triggers arise, such as complications, frequent hospitalizations/clinical encounters, or a decline in function. The goals of this stage of planning are to assess the patient’s understanding of the disease progression (and related treatment options) and to identify goals of care in bad-outcome situations. While it is assumed that full care and treatment will continue, the NS ACP conversation helps to clarify when goals of care would shift based on the patient’s clarification of unacceptable outcomes. This in-depth discussion a) helps patients understand their illness progression, b) identifies gaps and needs, c) identifies the range of treatment options for their disease progression, and d) prepares healthcare agents for a future decision-making role. Last Steps® (LS) ACP is initiated as a component of quality end-of-life care for frail elders and those whose death in the next 12 months would not be unexpected. The LS planning conversation is focused on goals of care to make timely, proactive, and specific end-of-life decisions. Ideally, these decisions are converted into medical orders that can be followed throughout the continuum of care. The Physician Orders for Life-Sustaining Treatment (POLST) program is the nationally recognized model for this stage of planning. 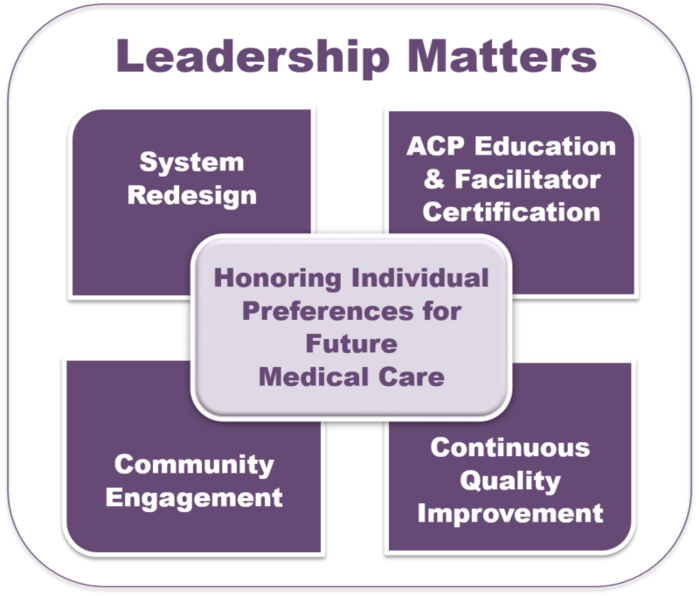 The ability of any health system, organization, or community to achieve their desired person-centered care outcomes is dependent on a commitment to designing key ACP systems. These systems must be hardwired into routines of care to assist healthcare professionals and providers in delivering consistent, evidence-based care. This level of commitment to systems design requires leadership buy-in and a commitment to human and financial resources. Leadership Matters. Without exceptional and sustained leadership, the system will fail. System Redesign. This includes building an ACP team, designing workflows to test, creating an ACP document, and building storage and retrieval systems. ACP Education and Facilitator Certification. Educating staff and certifying Facilitators is crucial to building a competent ACP workforce. Community Engagement. Designing materials and strategies that engage (including for diverse populations) and motivate. Continuous Quality Improvement (QI). RC uses the Five Promises as the QI framework. A model for continuous QI based on the “Five Promises” of an ACP System. This model allows for and supports cultural transformation. An ACP Facilitator is an individual (such as nurses, social workers, and chaplains) to guide FS, NS or LS conversations and ensures a consistent and reliable delivery of ACP services. An ACP Instructor is an individual who prepares, teaches, and certifies others as FS, NS, or LS Facilitators. Organization Faculty (OF) is an individual who assumes a key leadership roles, becomes system design experts, and teaches Facilitator and Instructor Certification courses and Design and Implementation Workshops. This role is a crucial element of successful program implementation and sustainability. ACP Coordinators are individuals who help manage the implementation, dissemination, and sustainability of their ACP program and are mentored by OF.